Are you going to recruit and employ the Assistant Store Manager ?? This template will perfectly suit your needs! Specific details of a store manager job description vary depending on the size of the company as well as what it deals in. Generally, one is expected to oversee any activity that affects the store as well as keep records especially those dealing with entry or exit of goods. The manager may delegate these duties to subjects but still remains responsible. Apart from safely arranging and tracking goods, firms may require the person to furnish top management with weekly or monthly reports on the status of stock. This involves recommending the purchase of certain items when they are running low or advising the company not to place orders for others. Our Job description has helped many people to reach the next level of their success. Get free job description templates! 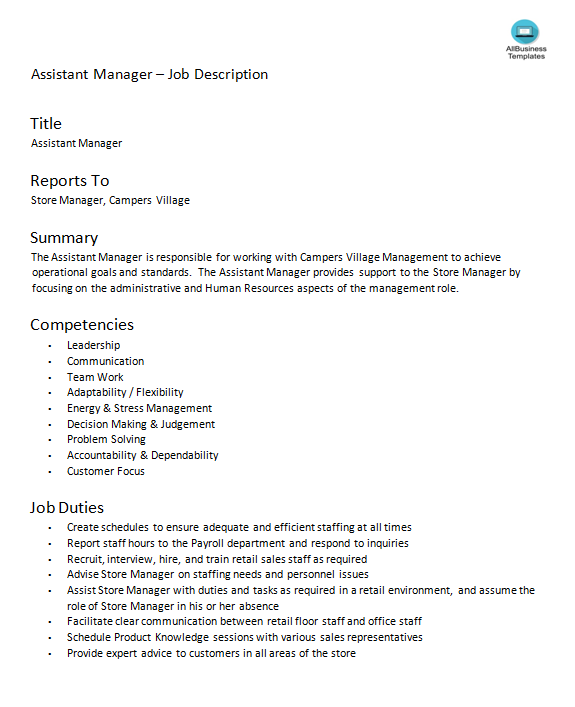 Download our Assistant Store Manager Job Description Free Word template now!